New York, NY – Artists and community groups seeking a space to perform or meet would be able to search and rent city-owned or operated spaces online under “City Spaces” legislation authored by Council Member Ben Kallos with Council Members Jimmy Van Bramer, Laurie Cumbo and Helen Rosenthal. The Department of Citywide Administrative Services (DCAS) that manages a large portfolio of the city’s properties, will be required to post all suitable properties and accompanying information to a publicly accessible website where artists or anyone can rent municipal spaces. 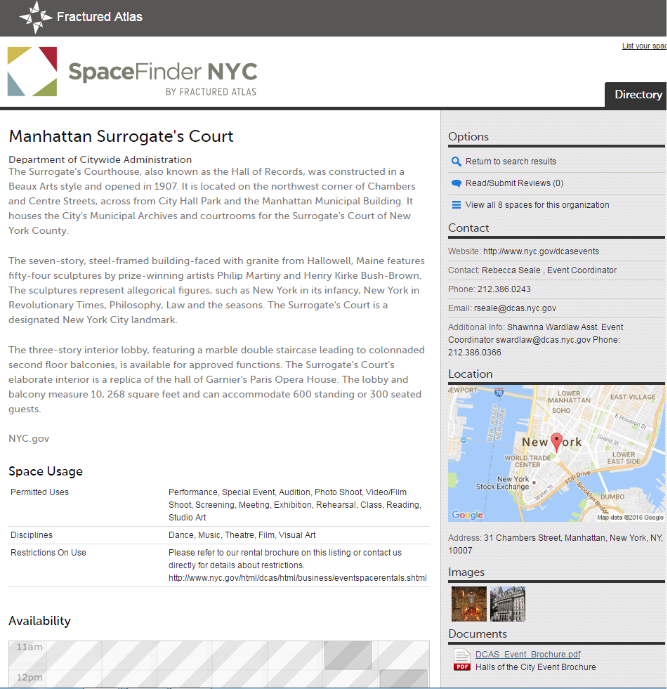 This follows years of work by Kallos as Chair of the Committee on Governmental Operations with DCAS who have already posted 8 spaces on the Fractured Atlas SpaceFinder.org website, which provides an easily searchable database of available spaces and a streamlined application process for low-cost, short-term booking and rental. The legislation will cut the red tape to access marquee public spaces like Brooklyn Borough Hall as well as other smaller venues and property lots, while increasing revenue for the city. “The arts are what make our city special. By making public space available to artists for after-hours use, the city can continue to support the arts while generating revenue. Providing artists with low cost rehearsal and performance space will help ensure our city remains the cultural capital of the world,” said Jimmy Van Bramer, Chair of Cultural Affairs Committee. "New York City is home to a vibrant community of artists and performers. By giving them access to City spaces at an affordable rate, we can help the creative community thrive. I thank Council Member Ben Kallos for his leadership on this issue," said Council Member Helen Rosenthal. "Arts organizations have long struggled in the City of New York to secure affordable arts and cultural spaces for short term rentals for artistic displays and fund raising endeavors. It has gotten increasingly expensive throughout the five boroughs to find affordable rental space in our city’s premiere artist enclaves. The success of our arts communities, the spirit and vitality, has made these neighborhoods incredibly desirable, and sadly it has become their detriment. Artists are the first ones to be forced to leave their neighborhoods due to increasing demands from landlords and real estate developers. As the founder and previous Executive Director of the Museum of Contemporary African Diasporan Arts (MoCADA), I understand the struggles that not for profits have in securing space to exhibit art and present performance presentations. The 35th Council District has seen massive development and gentrification, and I am most certain that our arts groups will be overjoyed to have a new set of city-owned spaces to rent for their artistic presentations,,” said Council Member Laurie Cumbo, who founded the Museum of Contemporary African Diasporan Arts (MoCADA). “The biggest pressure on independent artists today is the rising cost of space. This proposal tackles the root of the problem by finding new opportunities for independent theaters to affordably develop work, sparking more exciting cultural innovation.” Guy Yedwab, Executive Director, League of Independent Theaters of New York (LITNY). "Space is key to an artists' ability to create their work. If we want to keep producing talent in our amazing city and maintain our status as the Cultural Capital of the World, we must provide free or low cost space to artists here," said Randi Berry, Executive Director IndieSpaces. "The real estate assets that the City government is stewarding for the benefit of New York City's many publics are natural gathering places. It's wonderful that Council is pushing for greater access to our shared places and minimizing the barriers for culture creation in them," said Paula Z. Segal Esq. Executive Director at 596 Acres’ Community Land Access Project. In 2013, the League of Independent Theaters of New York issued a platform that included leveraging property owned by the City of New York as low-cost performing spaces after hours.